Klipsch celebrates 70 years with limited edition Heritage speakers | What Hi-Fi? 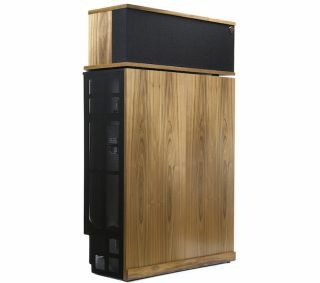 To commemorate its 70th birthday, Klipsch will be producing 70 pairs of both the Klipschorn and Heresy speakers. The Klipschorn speaker was launched in 1946 by company founder Paul W Klipsch, and aimed to deliver “the power, detail and emotion of a live performance at home”. It’s been in continuous production for the past 70 years - and has remained relatively unchanged. The speaker comprises a full range, three-way system with a 1in compression tweeter, 2in midrange and 15in folded-horn woofer. It stands at 1.28m and weighs a mammoth 79.5kg. For the new 70th Anniversary edition, of which 70 pairs will be made, Klipsch has fully-enclosed the rear low-frequency horn, which means you can now be more flexible with placement, the enclosure acting as a corner. Each pair of 70th Anniversary speakers will feature a nameplate detailing its history as well as its numbered sequence in the series and the signature of the craftsman. They’ll come with an Australian Walnut wood veneer with complementary silver grilles and will be available from May for $16,000 per pair. The Heresy speaker meanwhile was introduced in 1957, originally as a centre channel speaker to accompany the Klipschorn (a pretty serious set-up). Now in its third generation, the Heresy has been given a more powerful woofer, a bi-wire network, and mid-range and tweeter compression drivers. The 70th Anniversary Heresy will also come with a nameplate, number and signature. It also has an Australian Walnut wood veneer with silver grille and a matte-black slant riser base and is available now for $3200 per pair. And remember, in the words of Klipsch: "You're not buying a speaker - you're buying a piece of American audio history with badass sound."